Nancy Pelosi was on fire with her fellow Democrats. Minutes after a very public showdown with Donald Trump over his border wall with Mexico, the California Democrat returned to the Capitol and railed against the president in a private meeting with her colleagues. Congressional Democrats are feeling smug — and actually a little excited — for the looming shutdown fight with the president after Tuesday’s Oval Office meeting. The president may have decided at the last minute to open up the entire negotiation session to the public to throw Pelosi and Senate Minority Leader Chuck Schumer off their game. But in the end, Democrats feel confident that their leaders came out ahead. Trump, Democrats argue, fell into a trap the minute he took ownership of what Pelosi has dubbed “the Trump shutdown.” Absent a bipartisan agreement on Trump’s border wall, about a quarter of the government will run out of money on Dec. 21. But instead of finger-pointing, as Republicans and Democrats usually do during spending standoffs, Trump said he wanted to close the government and said he wouldn’t even try to pass the blame. The comment left Republicans on the Hill perplexed. Even some Democrats scratched their heads. But the comments, Democrats say, work to their benefit. Their leaders looks like the only reasonable adults at the table: they were the only side arguing that a government shutdown is a bad thing. And if House Democrats wanted to see how the next potential speaker would match up against Trump, they got a pretty good glimpse of the future Tuesday. Indeed, the episode is likely to help Pelosi in her bid to round up the 218 votes to be speaker. 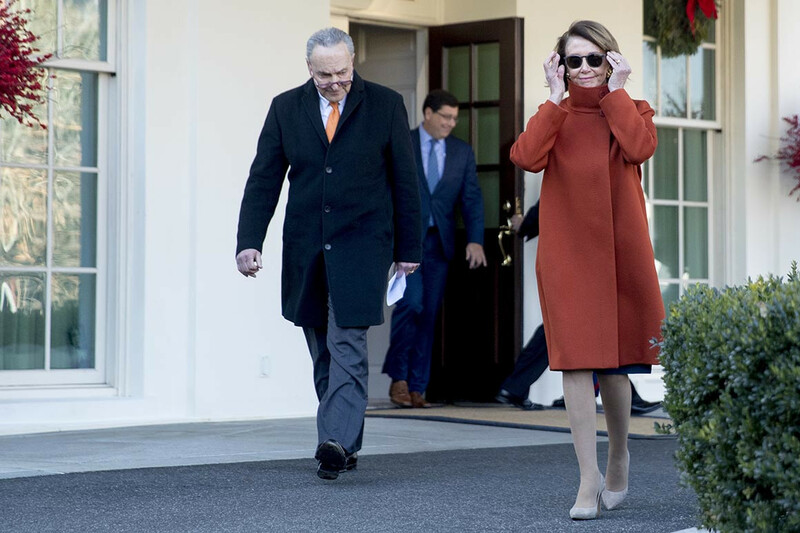 It was in that vein that Pelosi harped on Trump as she returned to the Hill to join her colleagues at a Democratic Steering Committee meeting Tuesday afternoon. She told the room the party was well positioned to fight in this shutdown showdown — particularly after Trump’s comments in the televised negotiation. At one point, after reporters and TV cameras left the Oval Office, Trump told Pelosi and Schumer that the new trade agreement he recently struck with Canada and Mexico was going to pay for the wall, Pelosi told lawmakers. On the campaign trail, the president had vowed that Mexico would pay for any southern barrier — not the United States. Pelosi and Schumer reminded him during the rare public meeting Tuesday that he failed to keep this vow. In private, however, Trump suggested both U.S. neighbors would pay for the construction with the new NAFTA agreement. The failed negotiations raise the stakes of partial shutdown just days before Christmas, according to multiple House aides. And with both sides dug in, a funding lapse could last weeks, forcing Pelosi to deal with reopening the government as her first order of business in the majority. Some rank-and-file Democrats fear a shutdown — or even a stopgap funding bill — could hamstring their work in the first few days of the majority as they look to advance their own agenda.